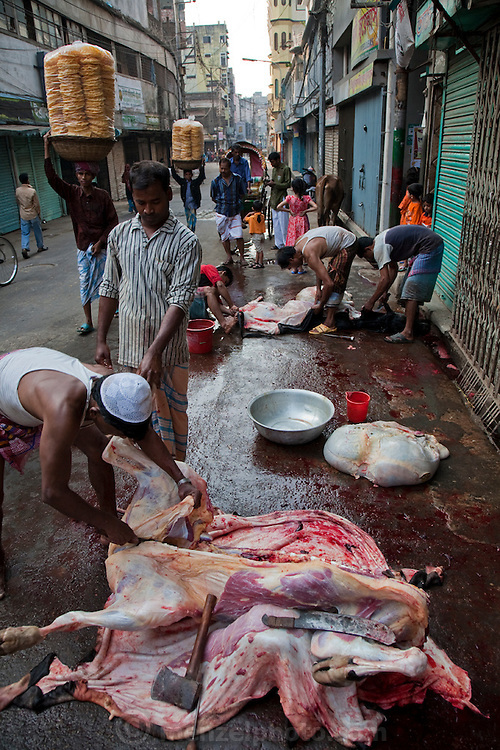 A man butchers a cow on the street in Dhaka, Bangladesh. Bangladesh has the world's fourth largest Muslim population, and during the three days of Eid al-Adha, the Festival of Sacrifice, Dhaka's streets run red with the blood of thousands of butchered cattle. The feast comes at the conclusion of the Hajj, the annual Islamic pilgrimage to Mecca. In both the Koran and the Bible, God told the prophet Ibrahim (Abraham) to sacrifice his son to show supreme obedience to Allah (God). At the last moment, his son was spared and Ibrahim was allowed to sacrifice a ram instead. In Dhaka, as in the rest of the Muslim world, Eid al- Adha commemorates this tale, and the meat of the sacrificed animals is distributed to relatives, friends, and the poor.